How to combine parenthood and career? – What challenges do Ukrainians face when combining parenthood and career, and particularly when returning to professional life after a parental leave? In Ukraine it is usually women who put their professional lives on hold in order to care for a baby, and their rights in this case sometimes turn into their burden. Ukrainian legislators have placed so much emphasis on the recommendations of international organisations that Ukrainian women are now overloaded with benefits and this sometimes means they become uncompetitive in the labour market. For instance, business trips are strictly prohibited for a mother of a child under three years old, even if she has the desire and ability to go. At the same time, despite having the necessary qualifications, a woman may be excluded from consideration during a selection process simply because she has children and potential employers fear she might take sick leave from time to time. Reaching a compromise between parents and employers is a huge problem in Ukraine. In order to solve this problem, it will be necessary for the government to develop employment policies that do not limit parents’ career opportunities. – How does the situation in Ukraine differ from that in EU member states? Of course, problems around reintegrating parents into the labour market do not exist only in Ukraine. Parents’ challenges after parental leaves are universal: upgrading their qualifications, maintaining contacts with colleagues, considering working from home, seeking a flexible timetable and finding their child a place in a childcare facility (especially if the employer offers child care). In the EU there are different ways of solving this problem. For example, since Germany has a shortage of skilled workers, the state itself stimulates the reintegration of women into the labour market. In particular, the government made an interesting decision: parents are allowed to cut their parental leave short and carry it over for use later – when the child goes to school, for example. The Project has already proposed a similar legislative initiative to the Ministry of social policy of Ukraine. – To a significant degree, support for young parents is the responsibility of employers. What motivates employers to consider the interests and needs of their employees, and in particular young parents? The approach of big western businesses in relation to their employees can be summarized by the motto of BOSCH: “I would rather lose money than trust.” Businesses invest in creating comfortable working conditions for their staff members and this in turn stimulates them to work to full efficiency. Having a reputation as a socially-responsible enterprise is very attractive to businesses since it means productive staff and reliable operations: things that are crucially important for investors. This is the main motivation for employers. Additionally, employers in the West try to take care of young parents. For instance, they provide childcare services for their employees’ children. This kind of service also exists in Ukraine, though with some conditions. For example, legislative complexity makes it complicated for employers to open a childcare facility. Nevertheless, employers look for other ways of retaining qualified personnel. For instance, they may be prepared to pay for a nanny in order to encourage employees to return to work. 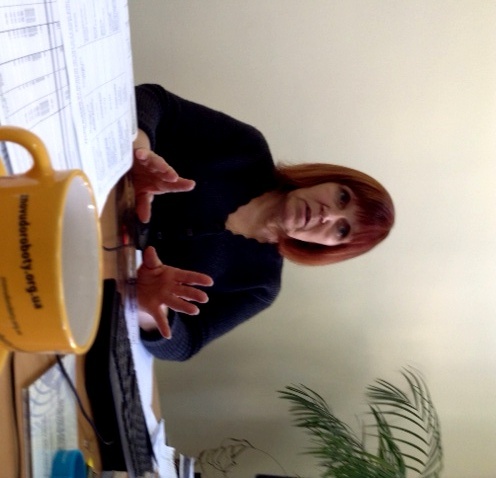 – The “Back to work” project collaborates with big Ukrainian employers. What does collaboration consist of? We started collaborating with Ukrainian enterprises at the end of 2012, when we were conducting our preliminary research during the first stage of the project. We consulted with about 120 Ukrainian businesses in order to find out their position concerning young parents and their reintegration into the labour market after the birth of a baby. The next stage of collaboration will occur during 2014 and consist of evaluating these employers’ reintegration mechanisms. Several major Ukrainian employers agreed to participate, including some in Kyiv, Luhansk, Sumy, Zhytomyr, Dnipropetrovsk and other Ukrainian cities. We already have a framework for evaluating the reintegration mechanisms of each of the 13 participating employers. Based on the results of this practice, we will create a concrete procedural framework for their implementation in Ukraine. Because these mechanisms were all invented abroad, they may need to be adapted to national peculiarities. – A huge percentage of Ukrainians, and in particular mothers-to-be, are not officially employed even though they are working. Can they count on any help during and after a parental leave? Unfortunately, unofficial employment does not guarantee anything. The best move for parents in this case would be to apply to an employment centre. Our project deals with helping unemployed mothers find employment as well: they can upgrade their qualifications, work toward a university degree, etc. Moreover, we work with the staff members of the state employment centre, which basically plays the role of an employer for unemployed citizens. Within the framework of our project, we hold seminars for trainers, who will work with target groups in the pilot regions. Among other things, this work aims at discrediting some stereotypes that limit the opportunities for mothers to integrate into the labour market. – Are men a part of the target audience of your Project? How often does the question arise of their reintegration to the labour market after a parental leave? The project is aimed at both women and men since Ukrainian legislation allows them both to take a parental leave. Nevertheless, only 1.5% of Ukrainian men today take advantage of this opportunity. One of the reasons for this is that public opinion is that raising a child is primarily a mother’s responsibility. At the same time, financial factors also play a huge role because men traditionally earn more. In Ukraine, about 60% of mothers earn about UAH 1500 per month and less than 10% earn more than UAH 4000. Women rarely work during their parental leave because their wages and working conditions are not good enough to entice them to remain in the workforce. On average, women earn less than men in EU member states as well. Nevertheless, the percentage of fathers who take a paternity leave is much higher in the EU than in Ukraine. The difference is that European states encourage men to make this decision. In Germany, for instance, men are allowed to take a two-month leave in addition to a full maternity leave. The same practice exists in Scandinavian countries. We do not have a similar mechanism of encouragement here in Ukraine. – Employers often do not conceal their unwillingness to employ a young woman because of a possible future pregnancy, even when she is fully qualified for a job. What would be your advice in this situation? It is really a problem. During recruitment, employers often ask young women to write a letter of resignation with an open date or to sign an agreement not to take a maternity leave during a certain period. Of course, this violates women’s rights, but there is not always a way to improve the situation. The worst solution for a woman would be to agree to sign such a document since it releases the employer of any responsibilities. Ukrainian legislation prohibits withholding employment from a woman because she has young children or may become pregnant. But it remains almost impossible to lodge a formal complaint against employers. Our project has submitted a legislative proposal on prohibiting employers from asking a woman about her family status during the selection process. Nevertheless, it is almost impossible to control the job interview, so this recommendation remains in the hands of the employers. The“Back to work: reintegration of parents to professional life after a parental leave” project is an EU-funded initiative that is implemented but the NGO, “League of social workers of Ukraine.” The EU contribution to the project amounts to € 559,233. The project’s duration is three years (November 2012 – November 2015) and it aims at creating favourable conditions for the successful reintegration of parents to the labour market after a parental leave. In the long-term, it will contribute to the economic equality of men and women and improve women’s access to economic resources. Project partners: Ministry of Social Policy of Ukraine (main beneficiary), employers of all forms of ownership, Confederation of Employers of Ukraine, State employment services, trade unions, and NGOs that work with gender equality issues.